Softens & cares for your clothes. Safe for sensitive skin. Full of smart green science. Extra-soft new formula. Plant based & mineral ingredients. Suitable for septic tanks. UNEP award. Cruelty-free international.New improved fragrance! 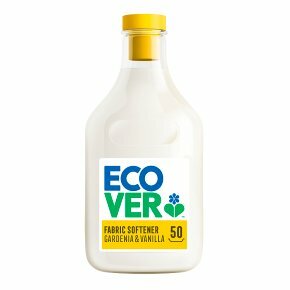 Gardenia & Vanilla Ecover Fabric Softeners feature new, authentic fragrances inspired by nature that delight the senses. Our new formulas are 92% naturally derived, contain softening agents derived from rapeseed oil and soya bean to boost softness without compromising sustainability. Usage: Do not put undiluted Fabric Softener directly onto your laundry. Not suitable for silk. See pack for full dosage instructions.